Prominent & Leading Wholesale Trader from Chennai, we offer spring retractable fuel reels. 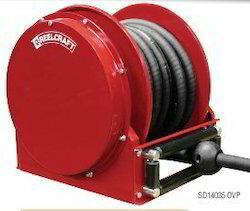 We are the noteworthy trader, distributor and supplier of Spring Retractable Fuel Reels. Our offered retractable fuel reels are broadly demanded in the market for their design and durability. These retractable fuel reels are made by utilizing fine grade material and leading techniques in accordance to market norms. Along with that, the retractable fuel reels offered by us can also be provided in several modified options as per the numerous requirements of our customers. Looking for Spring Retractable Fuel Reels ?